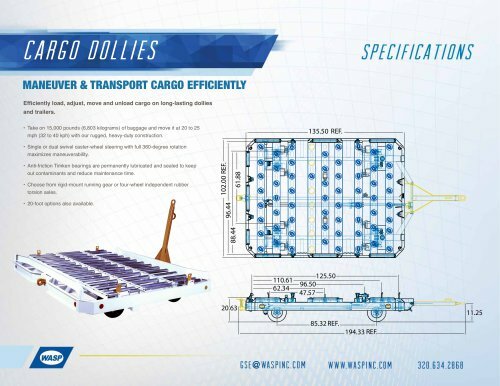 CARGO DOLLIES MANEUVER & TRANSPORT CARGO EFFICIENTLY Efficiently load, adjust, move and unload cargo on long-lasting dollies and trailers. • Take on 15,000 pounds (6,803 kilograms) of baggage and move it at 20 to 25 mph (32 to 40 kph) with our rugged, heavy-duty construction. • 20-foot options also available. • Choose from rigid-mount running gear or four-wheel independent rubber torsion axles. • Anti-friction Timken bearings are permanently lubricated and sealed to keep out contaminants and reduce maintenance time. • Single or dual swivel caster-wheel steering with full 360-degree rotation maximizes maneuverability.